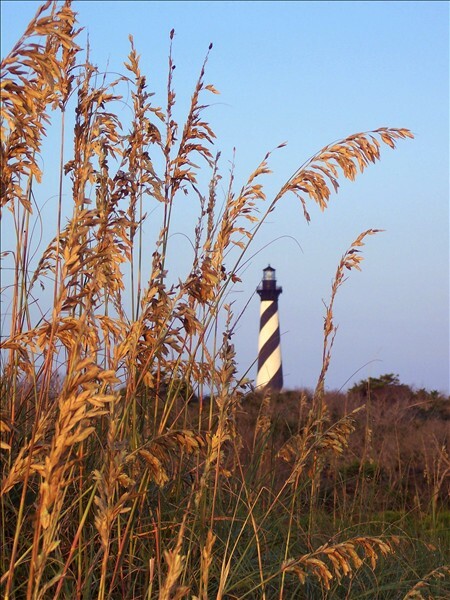 Description: This is one of my favorite photos of Cape Hatteras Lighthouse taken during the fall of 2008. Yep, those sea oats stage of development reveal the season out here....that and all my acorns on the ground. Lovely photo. Nicely framed by the sea oats. This picture immediatly puts me into the cool weather mood, grab a cup of hot chocotale and keep warm with the ones you love. Being from the Northeast I generally have a different view and feel for Autumn, than what one would normally see from an ocean shoreline. When I saw this picture though, I was immediately hit with the feel of Autumn. An early chill in the air. And the lighthouse a reminder of the past summer.